(1) There is no justification whatsoever (religious, political, moral or otherwise) for the murder of children. (2) The child suicide bomber is as much a victim of a human rights violation as are the innocent civilians killed in his/her explosive wake. The child suicide bomber is a product of a very shrewd (often state-sponsored) brainwashing and recruitment strategy that literally targets children from infancy and teaches them that the greatest thing they can aspire to is to become a "martyr." (3) Child suicide bombers are not freedom fighters, they are not a product of desperation or poverty, nor are they the natural result of a community occupied by a foreign force. Rather, children like Hussam Abdu (the main character of The Making of a Martyr) are the product of adults acting with a reprehensible indifference to human life and with a calculated intent to kill innocent children. (4) Teaching children to violently blow themselves to pieces, to become child soldiers or to act as human shields, through their school text books, radio, television and print media, by religious clerics, school teachers and by their political leaders, is the main contributor to the manufacturing of terrorism. Such practices are a most egregious form of child abuse akin to mass infanticide. (5) The state-sponsored or tolerated incitement, education and recruitment of children to violently kill themselves and others for any sake is a form of societal suicide that must be condemned, combated and confronted in the international arena. (6) Turning a blind eye to the brainwashing and recruitment of millions of children to become suicide bombers and child soldiers is inexcusable and gives terrorists the green light to continue with their tactics. CRI is a 501(c)(3) approved tax-exempt charitable organization. For information (free of charge) about CRI's charitable status, including CRI's 501(c)(3) tax exemption application Form 1023 filed with the IRS, its IRS Exemption Letter, and any IRS 990 Forms filed within 3 years of the request, please email us at admin@childrensrightsinstitute.org. The main character of the film is Hussam Abdu, a fifteen-year-old physically handicapped Palestinian boy recruited against his parents' will to become a suicide bomber. After luring Hussam by using his under-age neighbor, the Al-Aqsa Martyrs Brigade paid the child the equivalent of twenty U.S. dollars in exchange for his life. Hussam was filmed for a "farewell video" and then driven to the Hawara checkpoint where he was instructed to detonate amongst both the Israelis and Palestinians waiting on line. Fortunately, Hussam proved smarter than the adults who recruited him and voluntarily turned himself in. He chose life over death. Subsequently, the failed child bomber was arrested by the Israeli Defense Forces, tried and convicted of attempted murder and is currently serving out an eight year sentence in the HaSharon prison outside Jerusalem. Unfortunately, Hussam is just one of thousands of Palestinian children who are being taught on a daily basis, through their schools and by their own community, that a paradise awaits those whose bodies are blown apart for the sake of jihad (holy war.) Since the second Palestinian Intifada (uprising) was launched in 2001, a disturbing number of children have been murdered as human bombs, sometimes detonated by remote control to avoid them "chickening out" and even more have been intercepted and/or arrested for participating in violent activities. What is shown in the movie is a product of two years' worth of interviews by the filmmakers, who risked their lives and ventured into the West Bank during a time of intense conflict and mass murder with the goal of personally interviewing both the perpetrators and victims of these crimes. 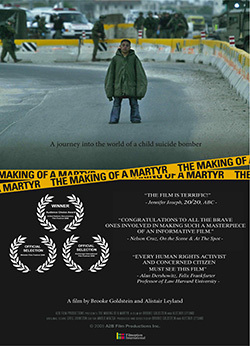 The Making of a Martyr is the recipient of the Audience Choice Award for Best Film from the 2006 United Nations Documentary Film Festival. Martyr has also screened in the Whistler Film Festival, Brooklyn Film Festival, Alaska Film Festival, and the Liberty Film Festival amongst several others. The documentary is fifty-eight minutes in length and is currently broadcast on television stations throughout the globe, including in the Middle East (Yes Docu), Canada (CBC), Korea, and Sweden. Do you think that child suicide bombing is a legitimate form of warfare? No, there is no justification whatsoever to kill innocent children. Support CRI and help us expose the ongoing abuse of innocent children. CRI is a registered 501(c)(3). Donations to CRI are tax deductible to the full extent provided by law. Baking for Good has agreed to donate 15% of the value for all orders specified to benefit CRI. Help support our initiative and taste their delicious products.